There are very few adults who would be unfamiliar with at least some of the tales from the 18 volumes of Sir Richard Burton's version of One Thousand and One Nights, but the stories these were translated from predate Burton's 1704 release by almost 1000 years, with mention of similar tales found on papyrus scrolls from the Ninth Century AD. Needless to say, these Persian, Arabic and Indian folk tales have been handed down over generations into the versions we know today, and which serve as the basis for this four hour (broadcast) television miniseries. This production required the erection of a brand new, 32,000 square foot film studio in Turkey to house its 48 sets, and was also filmed in locations from China to Yemen to Cairo, Egypt. The scale of production was massive, with over 4,700 costumes and 800 special effects shots used in its creation. We are presented with stories within a story. As the film opens, Sultan Schahriar (Dougray Scott) is about to be wed for the second time. His first wife's betrayal with his brother has left him untrusting of women, so he plots to kill his new wife come dawn. When Scheherezade, the daughter of the sultan's advisor, learns of his wedding plans and his scheme to rid himself of his next wife, she volunteers to wed him to save the other girls in the harem. Scheherezade (Mili Avital) is in love with the sultan, and knows that despite his fear of betrayal, he has a loving heart somewhere. After the wedding she begins to weave tales of fantastic proportions, and in an effort to spare her own life, ends each tale with a cliffhanger as the night ends, and puts off her impending demise in the morning. And so begin the tales of One Thousand and One Nights. The story of Ali Baba and the Forty Thieves, of the court jester BacBac, and tales of Aladdin and the Magic Lamp, the Greatest Wonder and flying carpets are told as the days pass by. However, as Scheherezade seduces her husband's imagination, his brother's army begins to assemble against Schahriar's sultanship. Produced by the same team that brought out Alice In Wonderland and Merlin, the gorgeous sets, elaborate costumes and intriguing locations are supported by a barrage of special effects that bring new life to these ancient stories. We experience five separate fables tied together by the story of Sultan Schahriar (a bit overplayed in my opinion) and Scheherezade. Since each tale features its own unique cast, look for Tchéky Karyo (The Messenger: Joan Of Arc, 1492: Conquest Of Paradise) as Black Coda, the head of the thieves, violinist extraordinaire Vanessa Mae making her film debut with John Leguizamo (Romeo + Juliet, To Wong Foo, Thanks for Everything, Julie Newmar) in dual roles as Genie, and Jason Scott Lee (Rapa Nui, Dragon: The Bruce Lee Story)in the story of Aladdin. 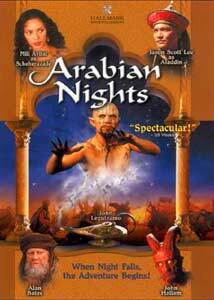 Well executed with plenty of action, Arabian Nights updates these classic stories as they have never been seen before. Image Transfer Review: Considering the amount of work that went into making this film, it is too bad the DVD image is affected by shimmering throughout the entire presentation, which is likely due to oversharpening of the image. Colors are rich and vibrant and black levels are fine. There is some artifacting, but the worst offender is the aliasing. Much of this may go unnoticed on smaller sets, but the problems are blatent on a large viewing screen. Audio Transfer Review: The Dolby Surround track is very good, with no noticeable defects. Thesoundstage is enveloping, and despite a lot of ambiance in the mix,dialogue is clear and intelligible. The score features a wide range ofethnic instruments suitable to the setting, and these are presented fullrange, and well positioned. Extras Review: Included is a behind the scenes making of, which includes interviews with the producers and many of the cast. There is a fair amount of background info here, and lots of on set footage. Running just over 13 minutes, it covers a lot of ground, and is a good companion piece to the film. With such an extensive cast, the bio section contains only brief info on most of the major stars in the form of a single page for bio info and a second for selected filmographies. With its plethora of special effects, great sets and costumes, the tales of Arabian Nights has been brought to new life on this DVD. If you enjoy solid storytelling, this production does these fables justice, and the disc will keep you occupied for nearly four hours.